When you’re 3-6, you’re going to hear plenty about your supposed deficiencies. On Sunday morning, one local paper suggested the Tampa Bay Buccaneers needed to get off to quicker starts in their games. Another raised the issue of involving WR Joe Jurevicius in the offense more. Well, the Bucs obliged on both accounts and rode the results to a dominating 35-3 victory over the San Francisco 49ers. Of course, it was an old Buccaneer standby, a unit that rarely draws lasting criticism, that really carried Tampa Bay to its fourth victory of the season. In its most oppressive outing of the season, the Buccaneers’ defense limited San Francisco to 197 yards of total offense, most of it in garbage time with the Bucs laying back and playing second-teamers. In fact, the 49ers gained only 26 yards and one first down by halftime. Each of their first six drives ended in either a three-and-out or a turnover, and the seventh only moved the chains once on a third-down roughing-the-passer penalty that looked like a borderline call. After the Bucs scored their third touchdown of the half, the 49ers offense earned its first first down on a meaningless, 14-yard run by third-string back Maurice Hicks. San Francisco had only six net passing yards in the first half, tied for the seventh-best mark ever by a Buccaneer defense. But more on those items needing improvement. Quick start? The Bucs scored three minutes into the game on a one-play drive, following the game’s first turnover. The team was economical in posting that first score, reaching the end zone thanks to one play on defense and one play on offense. 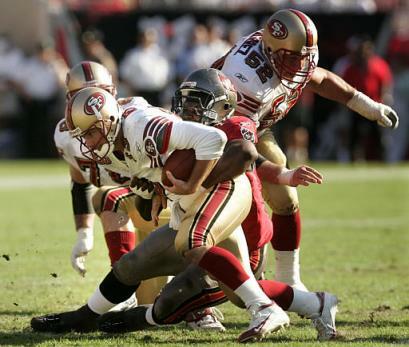 First LB Derrick Brooks timed a first-down blitz perfectly, stunting around left tackle Kyle Kosier and hitting QB Tim Rattay square in the back on the first play of San Francisco’s second possession. Rattay fumbled and DT Chartric Darby recovered at the 49ers’ 14, setting up Michael Pittman’s touchdown run straight up the middle on the next play. It was Pittman’s fifth rushing touchdown of the season, and the sixth for Tampa Bay’s offense in the last five games. Tampa Bay had no rushing touchdowns in its first five games of the season but has enjoyed something of a ground resurgence in recent weeks. Against the 49ers, the Bucs gained 159 yards on 35 carries, their best rushing totals of the season. Pittman recorded his third 100-yard game in the last four outings, picking up 106 yards on 21 carries. First-year man Earnest Graham added 27 yards on four totes and Alstott fought for 21 tough yards on seven carries. And involving Jurevicius? How about five catches for 82 yards and two touchdowns? After scoring on that one-play march, the Bucs’ next drive lasted 14 plays but failed to produce any points. An apparent touchdown run by Mike Alstott was erased by an illegal procedure penalty, and QB Brian Griese threw an end-zone interception to S Tony Parrish two plays later. However, Tampa Bay’s defense forced another immediate three-and-out, giving the ball back to the offense near midfield. Griese then drove the Bucs 57 yards on nine plays, finishing with a nine-yard scoring pass over the middle to Jurevicius on third-and-four. It was the first touchdown for Jurevicius since the opening game of 2003, when he made two acrobatic scoring catches in the Bucs’ win at Philadelphia. Since, he has battled serious knee and back injuries, missing the first six games of 2004 and all but five games in 2003. After his first score, Jurevicius matched his touchdown output from that Eagles game (tying a career high) by catching a 42-yard touchdown pass with 17 seconds left in the first half. WR Joey Galloway, who missed six games with a torn groin muscle also worked more intricately into the Bucs’ attack than he had all season, catching three passes for 33 yards. With all of those weapons – rookie sensation Michael Clayton also caught four passes for 66 yards - Griese had another strong outing. He completed 15 of 21 passes for 210 yards and two touchdowns, though didn’t protect the ball quite as well as he had in previous weeks. His two interceptions matched his cumulative total from the last five games, and he also nearly gave the ball away on a fumbled snap in the second quarter. Still, Griese has thrown at least one touchdown pass in all six games he has played as a Buccaneer (five starts). His cumulative passer rating this season is 104.4. 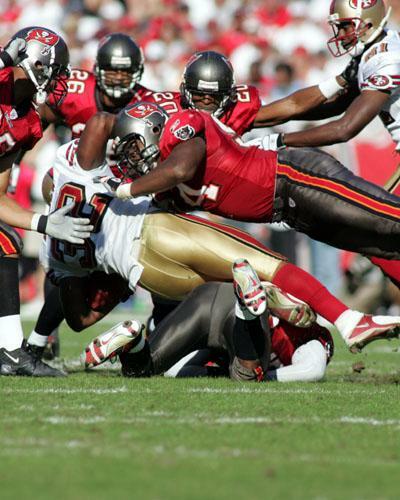 Brooks’s sack of Rattay, his first of the season, was one of five times Tampa Bay took down the beleaguered QB. The Bucs believed they could turn up the heat on the 49ers’ young quarterback after getting five sacks of Michael Vick the week before, and Defensive Coordinator Monte Kiffin and Linebackers Coach Joe Barry exchanged a high-five on the sideline after Brooks’s blitz. Rattay was on the run much of the day, forced into a series of desperation dumpoff passes that often fell incomplete. He completed just 15 of 31 throws for 147 yards, no touchdowns and one interception. Tampa Bay’s defense, which came into the game ranked sixth in the league, had its big day despite facing the 11th-ranked passing attack with two key starters out of the lineup. Defensive tackle Anthony McFarland and free safety Jermaine Phillips were out with arm injuries (McFarland’s season-ending), pushing Chidi Ahanotu and John Howell into those two spots, respectively. The Bucs didn’t miss a beat, largely due to the inspired effort of their intact linebacking crew. In addition to his early forced fumble, Brooks recorded six tackles and a sack for six yards. Ian Gold made eight tackles as well, including two stops from the one-yard line as San Francisco used two timeouts to try to score a touchdown in the last 10 seconds. Shelton Quarles added seven tackles and broke up a pass. Together, they held starting back Kevan Barlow to 30 yards on 14 carries. Leading 21-0 at halftime, the Bucs threatened to turn it into a rout by driving 62 yards for a touchdown on the opening possession of the third quarter. Clayton made the big play on the drive, gaining 36 yards on a fly down the right side one play after a similar gain was overturned by offsetting pass interference penalties. Pittman finished the drive with a six-yard touchdown run. However, San Francisco followed with its first sustained drive of the game and managed to break up the shutout. Two first-down runs by Hicks helped sustain a drive that lasted 15 plays and gained 51 yards, though it finally stalled at the Bucs’ 29 thanks in part to DT Jon Bradley’s first career sack. K Todd Peterson, who had come up short on a 50-yard try in the second quarter, hit a 47-yard field goal to cut the Bucs’ lead to 28-3. San Francisco’s momentum, such as it was, was short-lived. Second-year CB Torrie Cox, who has been playing an increasingly large role in the Bucs’ nickel defense, intercepted a third-down pass intended for rookie WR Rashaun Woods and returned it 55 yards for a touchdown and a 35-3 Buccaneer lead with eight minutes to play. Cox’s big play gave the Bucs their first defensive touchdown in five games and their third of the year. The other two belong to CB Ronde Barber on short fumble returns. (Barber, by the way, recorded one of the Bucs’ five sacks, his second of the season and the 17th of his career. The Bucs’ defensive dominance might be best expressed in the final numbers of tight end Eric Johnson, who came into the game as the leading receiver in the NFC. After allowing consecutive 100-yard games to tight ends Tony Gonzalez and Alge Crumpler, the Bucs held Johnson to just one catch for nine yards.